For the past five years, Pastry Chef Mark Ainsworth has been crafting organic pastries, breads and cookies for a number of San Francisco Bay Area hotels and restaurants, including the Carneros Inn in Napa and the Lodge at Pebble Beach. Now, you can enjoy his Pastry Smart products in your own home by picking them up at Mollie Stone’s, Real Food stores, Piazza’s and Shokolaat restaurant in Palo Alto, where he is the CFO. 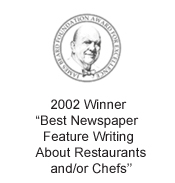 Ainsworth was previously executive pastry chef at the Lodge at Pebble Beach and the Ritz-Carlton in San Francisco. His Pastry Smart company is thought to be the first pastry producer in the United States to be American Humane Certified. The company also works exclusively with organic dairy Clover-Stornetta Farms. Recently, I had a chance to sample a variety of the baked goods, which are made in a commercial kitchen in San Mateo. 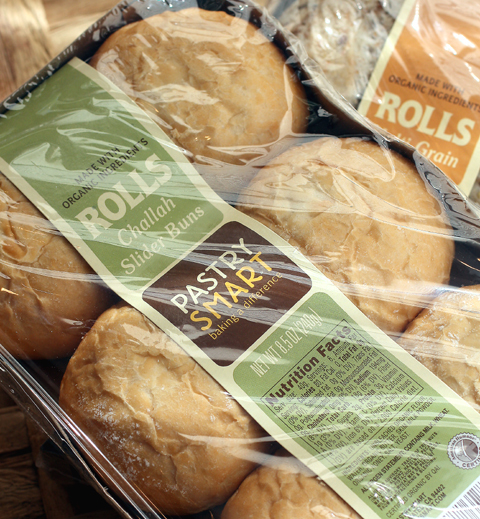 The retail line includes par-baked rolls that only need five minutes in a warm oven to enjoy at home. The challah slider rolls baked up crisp on the outside, tender on the inside, and buttery tasting, but not overly rich. They’d be great for dinner rolls for company or to stuff slices of ham into for Easter brunch. The multi-grain rolls had a nice nutty taste and a crunchy texture from the sesame and sunflower seeds that cover their exteriors. A package of six is about $6.99 each. The cookies are fist-sized and perfectly round — like lunch-bag staples from childhood. My favorite — surprisingly — was the vegan lemon shortbread. Made with vegan shortening, the cookies are very crumbly with a delightful topping of crunchy, crystallized sugar. Take a bite and they just melt in your mouth. I’m not even vegan, and I couldn’t stop eating these. A box of six cookies is $6.95. 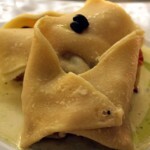 Pastry Smart also makes three types of savory scones, which would be perfect for lunch or dinner with a salad and soup. 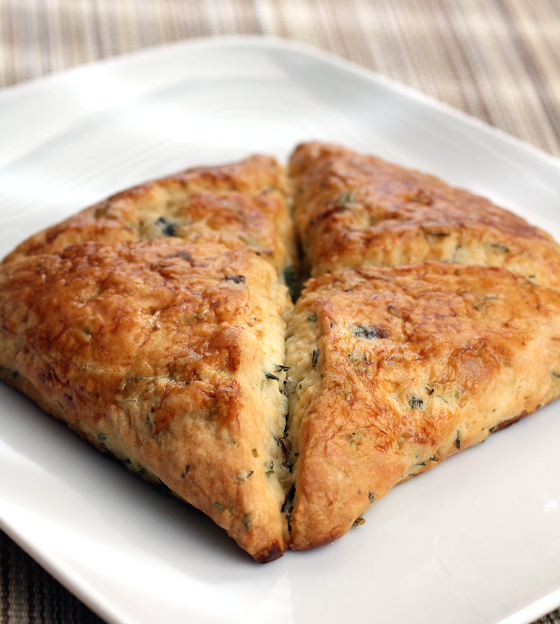 The curry scone is full pungent cumin seeds, curry powder and paprika. Like the curry one, the mushroom thyme scone has a fluffy, light crumb, but with a more herbal, earthy profile. Each square-sized scone is perforated into fourths to divide it easily into four bite-size pieces. But most folks, I’m sure, will see it and think they’re meant to eat the entire square. Just realize, though, that the calorie count on the back of the package is 130 calories for a fourth of that scone in your hand, and not the entire thing. 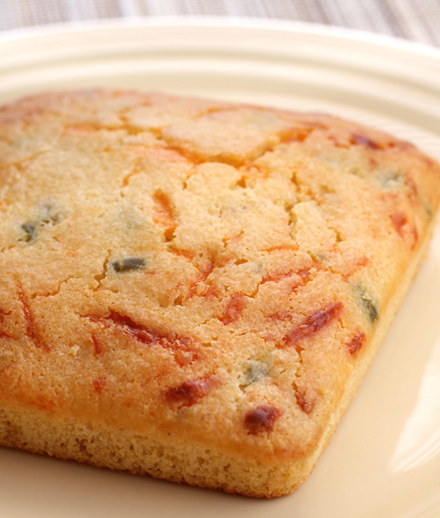 Same is true with the corn cakes — tender, cakey, corn bread squares that are about half an inch in height. The calorie count for these is 170 per quarter cake, though, few people are going to stop at just a quarter of one, especially when they come in flavors such as blueberry, and cheddar jalapeno. 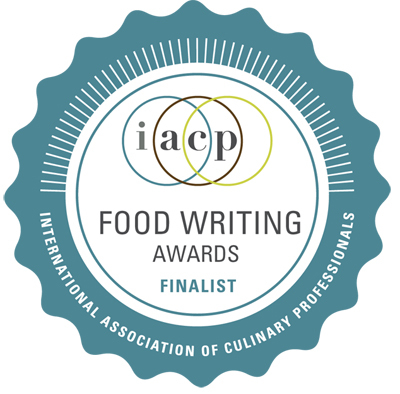 Contest: One lucky Food Gal reader will win a sampler of Pastry Smart goodies, which includes rolls, cookies, corn cakes and scones. Entries, limited to those in the continental United States, will be accepted through midnight PST April 9. Winner will be announced April 11. Just tell me about one of your favorite baked goods from childhood and why you still dream about it. Winners of Last Week’s Contest: In the last Food Gal contest, I asked you to tell me your fondest memory of Paris or why you most want to visit that city. 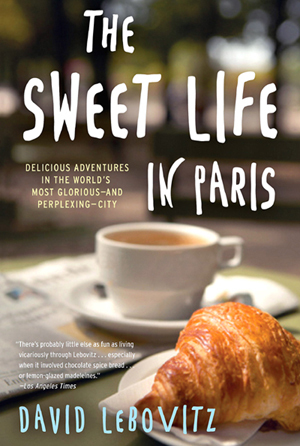 Three winners will receive a paperback copy of “The Sweet Life in Paris” (Broadway Books) by David Lebovitz. One of my favorite baked goods from childhood would have to be my mom’s pineapple upside-down cake. She used to let me help her bake it for special occasions, so it was always an anticipated treat – and it was fun that I got to say that I helped bake it. The bakery of the grocery store we went to when I was a kid would give childen a free cookie. I LOVED eating one of their sugar cookies while following my mother around the store & I still get excited about eating a bakery item from a sheet of wax paper! It transports me back 20 years..
We didn’t have a whole lot of sweets in our house, but I do remember my mom (and then me) making wheat germ chewies. 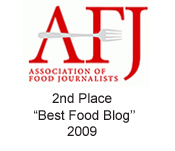 They were so good and we thought that they were healthy since they had wheat germ in them. I recently found the recipe and it calls for a cup of butter…def not healthy! Unfortunately, I don’t have just one favorite baked goods memory from my childhood . . .
Last one I’ll share is making butter cookies with my mom . . . her recipe was simple & easy to make and our whole family loved them! I always loved making cookies with her and getting to lick the batter off the beaters every time! thanks for sharing more than one of my favorite baked goods story from my childhood . . . they are with me often! When I was in high school I was an assistant for the typing teacher. He was a pretty laid back guy, but he had one strict rule. He never wanted to see what color gum students were chewing. Gum could be chewed, but there was punishment in store for those who slipped and blew bubbles or snapped their gum in their front teeth. A caught student had to bring a batch of chocolate chip cookies to share for the class. The student was to bake the cookies themselves – no mixes or slice and bake allowed. If the student got proficient in chocolate chip cookie making they had to move on to molasses cookies. Before then, I had never even heard of a molasses cookie. I soon fell in love with them and secretly hoped the good cookie bakers would slip up and have to bring a batch to class. Those spicy, chewy cookies are still a favorite of mine and my family and we bake them often – even if we haven’t been chewing gum. My mom bakes these amazing cheese puffs (gougeres). I haven’t had them in ages, but they’re absolutely amazing. My mouth waters just thinking about it! 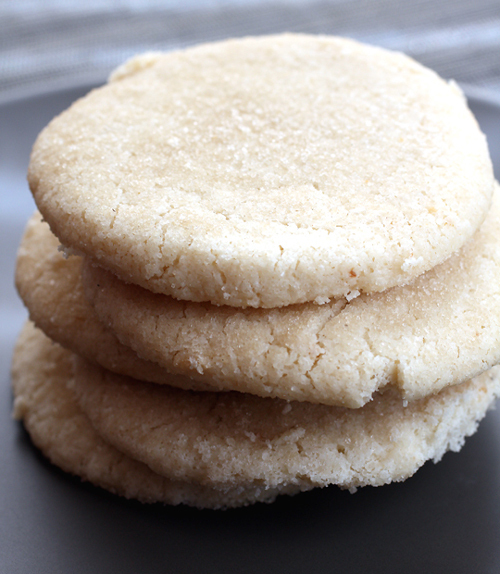 Bader’s shortbread cookies! They had a wholesale bakery in the Mtn View neighborhood where I grew up. The smell of freshly baked cookies greeted me whenever I walked home from school. For a $1, I could buy a whole bag filled with shortbread rejects. Happiness was digging into that wax bag (paper would have just absorbed all that butter) and pulling out a still warm cookie. The cookies are unlike any other shortbread cookies I’ve ever had – crisp, yet melted in your mouth. They were as light as air. When I was pregnant, this was the ONLY thing I craved. I’ve tried to find out if they are still being made, without any success. Bader’s, if you are still in existance, let me know! What I wouldn’t do for one more bite of one of your cookies. Sigh. Wow – Had not thought of these in such a long time – but it would have to be my grandmother’s cream puffs! Crispy on the outside, egg-y on the inside, loaded with fresh cream and dusted with powdered sugar. Holy Moley! What a wonderful giveaway Carolyn! Even though I am out of the running, I’m craving those cookies and a challah slider! My favorite baked good experiences always took place on Sunday mornings after church in Petaluma, CA. My great grandparents would always stop at Petaluma Market on the way home so my Gramma could pick up some (Clover-Stornetta) milk, cheese for lunch, and some pecan praline ice cream. If my little brother and I had behaved in church, said our prayers, and sang, my Grampa would take my brother and I around the corner to the A-1 bakery on the boulevard for a cookie. It was the best! You would be dancing down the street as the clouds of warm butter and sugar filled the air. Grampa would open the door and the hot sweetness would hit you like the sun in July. The owner was always right behind the counter in his white apron, smiling and beckoning us to pick out our favorite. Mine was always the frosted butter cookies shaped like a holstein cow. I can still taste the soft, rich cookie bathed in the smooth, sweet black and white frosting. Nothing could ever beat the Sunday mornings spent with Grampa and the cow cookies. My grandmother’s empanadas de cajeta y nuez are the best baked good I can think of. They are flaky and filled with delicious cajeta which is cooked condensed milk, and to that add some pecans. It is HEAVEN. Favorite baked good hm? Well that would be the delicious cornbread my mom would constantly make – with real corn of course. I realized soon enough that she bought it from a boxed mix from the store, but it had real corn pieces and it was all natural too! We would bring it to open houses, dinners, and holidays. People would always ask who made it and the recipe, regardless if they had previously liked cornbread or not. You could have never told it came from a box! I remember always eating the golden crusty layer of the cornbread, and still dream about it. So delicious. In the future I plan to make my own homemade version of this childhood delish cornbread. I’m getting homesick already! I love baked goods in general, but my family’s mocha cake is my absolute favorite. My grandmother, then my mom, and now I, make this cake for family birthday celebrations. My dad hates coffee and even he loves this cake. Unsalted butter (I use Clover Organic to make it even THAT much better), powdered sugar, vanilla, unsweetened chocolate, instant espresso dissolved in a bit of water, a pinch of salt and milk as needed for texture. Smear it all over a Devil’s food cake, cut and serve with a scoop of ice cream and you have nirvana. Friends & family can hardly wait for each celebration and my brother refuses to share the recipe. I share it, but it only really comes out right when one of the family makes it. This is a fab idea! Living on the other side of the world to my family, I am constantly dreaming of my mum’s and granny’s baking, especially granny’s bread which she bakes in her massive brick oven! I can’t win this but all the baked goods look great and what a pleasure to have home-baked goodness when you don’t have time to bake! I must say that my dad made his own gorgeous choux buns that he would fill with chocolate pudding and we would eat them topped with whipped cream. He also made luscious, sweet and tangy prune and apricot compote that was not only a gorgeous deep jewel-hued color but each mouthful offered a fabulous burst of flavor. I loved his desserts! When my mother brought home that special cake, I knew it would be a wonderful day! No offense to my mother, who is a great baker, there is this cake a friend of my mom’s used to make, the taste of which still is fresh in my mouth when I type this entry. It was a coffee cake (and when I say coffee cake I don’t mean the tea time cake but the one that has the actual taste of coffee-I know! some of us here have this thing for coffee, don’t we?!). It was a plain sponge cake slathered with a coffee flavored butter cream. Moist and fabulously delicious with a strong coffee flavor, she would decorate the cake beautifully too.And as we were kids and not allowed to drink coffee, we used to freak out on this cake! . My mom’s Chinese steamed sponge cake. The sponge cake is typically steamed in a bamboo steamer, but since we didn’t have one, my mom would steam it in a regular pot with a fitted lid. Growing up in a family of 6, my mom rarely had a second to spare, but when she did, she would make the sponge cake as a late-afternoon snack. When we heard the clang of the lid hitting the pot as the cake angrily steamed away, we knew we were in for a treat. As soon as the squares of puffy cake hit the table, we’d tear the pieces of hot, eggy goodness apart, burning our fingers in the process. Five minutes later, we were back at our desks, studying away, satisfyingly full. I’m going to have to say the chocolate babka from my childhood is the single best food on earth. It’s my mom’s mom’s recipe, and before she died (and sadly I never got to meet this incredible woman), she wrote just the ingredient names on a piece of paper. My mom practiced with proportions until she figured out how to recreate the babka, and then started making it for our family a few times a year. It was tradition to have it to break the fast after Yom Kippur, but between you and me (no judging, people! ), my mom would slice up some of the babka and make little Ziploc baggies for us and bring them to temple, and during the services, when we’re praying and supposed to be fasting, we could run to the car and nibble on some of this “forbidden” bread. Fortunately today, I don’t have to just dream about it. My mom instilled in me such an extreme passion for baking that I can make the babka myself and have it in LA 500 miles from her. Of course it’s more fun to have it with her, so I fly up to San Jose and we sit down and eat it together. I plan to make it a childhood treat for my kids one day. I want them to have the same amazing memories I have. 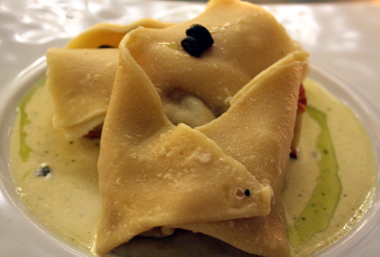 I dream of the sfogliatelle — better known as lobster tails — from the Italian bakery near my childhood home. I grew up in a wonderful Italian-American neighborhood, and sfogliatelle were my absolute favorite treat as a child, reserved for only the most special of occasions. I live in a different city today, but still make special trips to my local Little Italy for a delicious lobster tail on special occasions. Contest is now closed. Come back Monday to see who won and for the start of an exciting new contest.